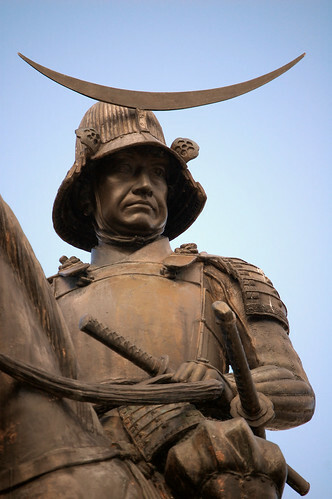 A statue of the famous Sendai feudal lord, Date Masamune (1567-1636). This statue sits on the site of the Aoba Castle, which is no longer standing. Masamune was a powerful figure in Japanese history and with a bit of luck may have become the ruler of all Japan. Although he was an ally to the Tokugawa, many were cautious and feared his power. He is famous today for his appearance–specifically, his missing eye which was a result of smallpox. The missing eye caused some debate over whether he was fit to take over leadership of his clan. He is currently one of the villains in an NHK TV drama which received of on the highest ever TV ratings.